Native to parts of southern China, lychees have long been valued for their sweet flavor. The oval-shaped lychee, with its reddish-brown skin, is a symbol of romance in Chinese culture. Fresh lychees can be difficult to find. This easy smoothie recipes rely on the intense sweet flavor of canned lychees, available in many major supermarkets. Lighter in calories than many other canned fruits, canned lychees add sweetness to this smoothie, while soy milk and silken yogurt up the protein, vitamin and mineral content, and add a richer flavor. To increase the health benefits of the smoothie even further, try adding a few spinach or kale leaves. While altering the appearance, they won't noticeably affect the flavor. This recipe is formulated to be high in nutrients and dairy-free, using soy milk and silken tofu. You can substitute non-fat yogurt and milk if that is not an issue for you. Place the sliced banana and canned lychees out on a baking sheet. Freeze for at least 15 minutes. Process the frozen fruit in a blender until smooth. Add the silken tofu, reserved lychee juice, and orange juice. Process again until smooth. Add the vanilla extract, honey or agave nectar, and ice cubes (if using) and process. Serve immediately in tall glasses, or chill until ready to serve. You want bananas that are fully ripe as they will add the most natural sweetness and flavor to your smoothies. Allow them to get well-mottled with brown spots. 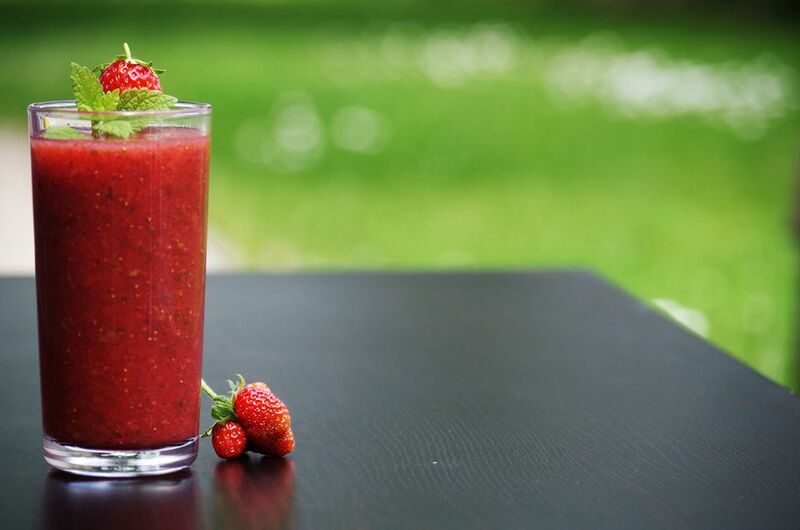 You can be prepared for making your smoothies by freezing the fruit in batches. Once your bananas are well-ripened, you can peel and freeze them whole or cut them into slices and freeze them. Freeze your lychees at the same time and any other fruit you plan to add to your smoothies. You can then package them in freezer bags in the portions you'll be using for each smoothie. Now you'll be ready whenever you want to make a frozen treat. Lychees have a mild flavor, you can add some tart punch with canned pineapple tidbits. Add a half cup of pineapple tidbits to the recipe, freezing them when you freeze the banana and lychees. If you have kale or spinach available, add a few leaves to the blend for additional nutrition and have a green smoothie.